It’s been a little quiet around here this week and I bet you already know why: moving out is the easy part! Moving in, hoo boy. You walk into an empty new home with freshly painted walls and there’s nothing but possibility. You run from room to room, whee! Then your stuff arrives and the pristine landscape is forever compromised. The first boxes aren’t so bad: you prioritize bedding, toilet paper, toothbrushes and whiskey (um, just play along here.) The next few boxes are pretty doable too: glasses go where they always have, books go in bookcases and lamps go on tables. But then, eventually, you get down to the last six boxes and you look around and you realize that the closets, cabinets, dressers and shelves are all full so where does this go? Then, if you’re us, the great unraveling begins: how did we get to a place where we had so much stuff? I thought we were going to resist the siren call of consumption (says she who just purchased what can only be considered a luxury ice cube tray). How did I get to a place in my life where I had 125 cookie cutters, 9 shades of sanding sugar and cupcake wrappers in at least 7 patterns that I can neither bring myself to throw away or justify the space they will take up? The last 6 boxes take forever to unpack; you’ll be glad you prioritized the whiskey. So, right on top of all of this, something else happened: my husband — who has the audacity to look younger and more handsome every year — turned 40. If you heard me freaking out (just a little) over our move being delayed a week, it was because the one thing we were trying to avoid was having people over for drinks and then going out to engage in vodka encased in ice blocks and tableside-prepped chopped liver but 24 hours after moving, which is exactly what happened, and of course, it was no big deal and, if anything, forced us to make quick work of the first half of the boxes. Happy birthday, baby: don’t you feel young after a few days of moving furniture around and schlepping boxes? My mother came over on Thursday ostensibly to help pack but really we made Alex a birthday cake. The general rule for Alex’s birthday cakes “chocolate and…” It can be ice cream or layer cake; it can be peanut butter, coffee or caramel or hazelnuts; it just has to begin and end with chocolate. And so we decided to make Martha Stewart’s raspberry swirl cheesecake, but with a chocolate crust and puddle of ganache over the top, but it turned out to be so visually stunning (oh, and fun too) that we couldn’t bring ourselves to cover it. The trick, and maybe all you food styling types knew this already but it basically blew our minds, is something I found on an old Martha video, is to make individual droplets of the raspberry sauce all over the top and then use a toothpick or skewer to swirl them. With this method, it is literally impossible not to make a beautiful cake, and my mom and I were, well, perhaps abnormally for other people but pretty squarely in what you should expect from us, excited about this. What happened next I am less proud of: we all but forgot about the cake. What? It’s been a busy week! I understand that this is like a breach of cheesecake contract, that we probably don’t even deserve to eat cheesecake now after showing it so little respect, but so it happened, nonetheless, that on Wednesday evening, four full days into my husband’s 40th year, we sat outside (the only place we can avoid the view of unpacked chaos) with friends with wedges of cheesecake on our laps and it was perfect. Our neighbors were out on the next deck so we brought them some too. I’m starting to think we’re going to like it here. Instagram: Just to make things complicated, I have two Instagram accounts, the first @smittenkitchen is the official one, you can use it to find out when there’s a new post up here. @debperelman is my personal one; I use it to document almost everything but food (though sometimes food too, of course). And, in the last week, I’ve been sharing glimpses of the new place and pleading for advice on various things that I’m clueless about. Okay, a tiny fraction of the things I’m clueless about. I don’t want to scare you guys. Alex’s Birthday Cakes, previously: Brownie Mosaic Cheesecake, Chocolate Caramel Cheesecake, Chocolate Peanut Butter Cake, Espresso Chiffon Cake with Fudge Frosting and, in the book, Chocolate Hazelnut Crepe Cake. Heat oven to 350°F (180°C). Wrap exterior of a 9-inch springform pan (including base) tightly in a triple layer of foil; set aside. Make crust: Stir together cracker crumbs, melted butter, and sugar in a medium bowl. Press crumb mixture firmly into bottom of pan and up the sides to about 1-inch from the top of the pan. I like to use the bottom and outside of a 1-cup measure to help press them in firmly. Bake until set, about 10 minutes. Let cool in pan on a wire rack. Reduce oven temperature to 325 degrees. 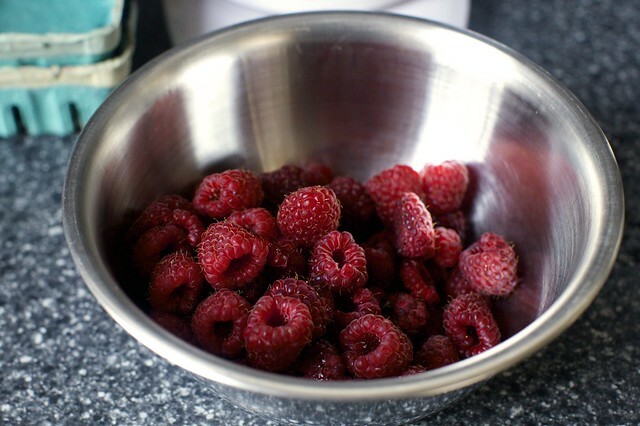 Make raspberry sauce for swirl: Process raspberries with sugar in a food processor until smooth, about 30 seconds. Pass puree through a fine sieve into a small bowl; discard solids. Set aside. 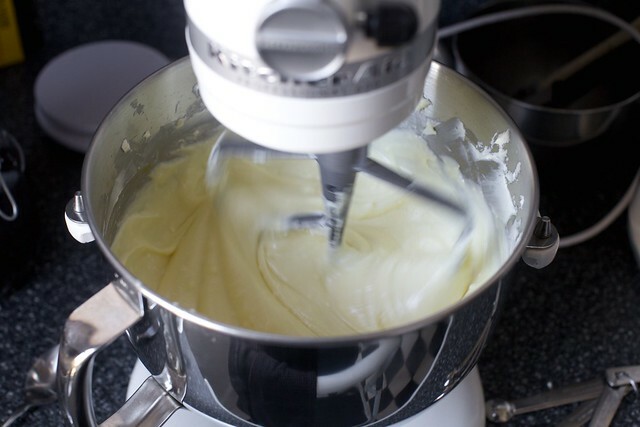 Make cheesecake: Put cream cheese in the bowl of an electric mixer fitted with a paddle attachment; mix on medium speed until fluffy, about 3 minutes. With mixer on low speed, add remaining 1 1/2 cups sugar in a slow, steady stream; scrape down bowl. Add salt and vanilla; mix until well combined. Add eggs, one at a time, mixing each until just combined and scraping down the bowl. Pour cream cheese filling over crust. Using a squeeze bottle, piping bag or a zip-lock bag with a tiny corner snipped off, place tiny droplets of raspberry sauce all over top of cake. Use a toothpick or skewer to swirl the sauce and filling together decoratively. I had extra sauce; it makes a delicious dessert sauce to serve with the cake. Transfer cake pan to rack; let cake cool to room temperature then refrigerate, uncovered, at least 6 hours or overnight. Before unmolding, run a knife around edge of cake. If you’d like to serve this with a chocolate sauce, bring heavy cream to a boil in a small saucepan. Remove from heat, stir in chocolate until melted. Serve cake in wedges, with any leftover raspberry sauce or chocolate sauce, or both. 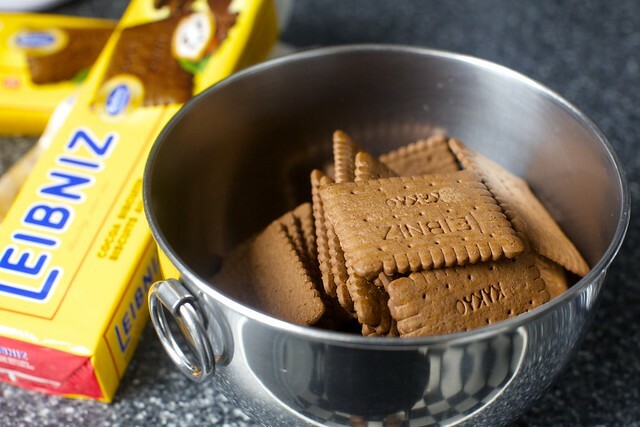 Chocolate wafers: I am ever on the hunt for chocolate cookies to make crumb crusts with. Nabisco chocolate wafers are the classic, but I can’t find them anywhere anymore. For a while, I used chocolate Teddy Grahams, because they were cute, but the artificial flavors became cloying. I know there are people who painstakingly remove the filling from Oreos for theirs, but I could never be trusted with that. This time, I tried Leibniz brand cocoa biscuits, something I can disturbingly not find a link to online anywhere (it’s the chocolate cookie, not the chocolate-coated one), which I found at a nearby bodega (I love NYC), which at least had fairly straightforward ingredients. When I found the crumb color a little pale, I added a couple tablespoons (just eyeballed it) of black cocoa powder I’d unearthed while packing to make them more Oreo-ish. If you’re feeling particularly devoted, the chocolate cookie I use for my Homemade Oreos is very, very quick and easy to make and makes excellent crumbs. You’ll make more cookies than you need for crumbs but nobody on earth will mind. Even more chocolaty crumbs: The cheesecake crust used here and here has ground bar chocolate in it too and it makes a firm cookie crust with a much stronger chocolate flavor. It would be lovely here. If you don’t want chocolate crumbs: Of course, graham or even digestive biscuit crumbs would work here. You might find that different brands and different crumb sizes absorb differently. If yours are too dry to build a crust, add a touch more butter; if they’re too wet, add another spoonful of crumbs. If you want more chocolate intensity: We’ve added a almost inch-thick ganache layer to the bottom crust of two cheesecakes in the past. You could do the same here, if you wish, but be sure that you are using a springform with 3-inch sides as it will be taller than the one I’m showing here. To amp up the raspberry portion: If you’d like the raspberry flavor to be within and not just on top, try this: pour 1/4 of the cheesecake batter into the prepared crust, then add droplets of raspberry all over. Do not swirl. Do this three more times. Only swirl on the top layer, but use a skewer or toothpick that will reach to the bottom (but stay above the bottom crust or you’ll make holes). The inner swirls will get mostly lost, but you’ll taste the raspberry. The top will stay stunning. Deb, this looks so delicious! I’ll be making it next week (or sooner since it looks so amazing! You can never have enough dessert, right?). My brother has a birthday coming up, and he loves cheesecake and raspberries, so this cake will be perfect! Oh my gosh. This is beautiful! We avoided those last six (or 60 boxes) for the past few years. Maybe we should get on that someday. Until then.. Cheers…Happy Birthday Alex! This looks SO amazing!! I love berry swirled cheesecake and Raspberry is my favourite! I cant wait to try this out! Wow! Despite the fact that I love cheesecake, I’ve never made my own before. 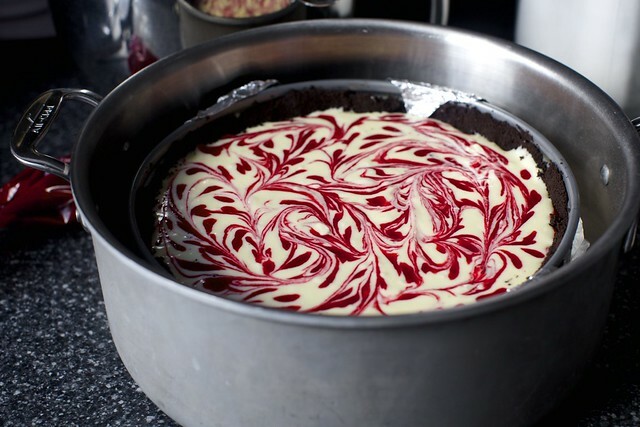 The raspberry swirl looks so pretty and I imagine the fresh raspberry flavor brightens up the richness of the cheesecake. Plus chocolate and raspberries are a dream together! Whenever I make chocolate cookie crumb crusts I always use your chocolate oreos – the crust is always so good sometimes it outshines the filling! Oh my, this looks incredible. I never dare make cheesecakes because I just can’t keep my hands off them. But I may have to make an exception and make this one. Could you explain why you use boiling water in the pan? I’ve made cheesecakes before, but I’ve never seen that! Vincenza — Of course. The water bath keeps the cheesecake from cracking, which almost always happens when they’re baked without one. It’s definitely more of a pain to make it this way, but it also improves the texture of the cake. I said it before; I’ll say it again. The alacrity with which you unpacked – amazing! Here’s to your new place and hope you’re loving it already. That light – magic. This looks gorgeous! In the ingredients it reads “6 unsalted butter, melted” … Tablespoons? How gorgeous is this?? I love the idea of a chocolate crust. Chocolate and raspberries = heaven. Congratulation to the birthday boy..
What was Alex’s reaction to the cake? I am curious – of all the ones you have made him over the years, which is his favorite? Hi Deb! I’ve never posted before, but have now read all of your posts after a blog-binge caused by the purchase of your book. Congratulations on the new home and new, upcoming book! I was wondering if you did two layers of raspberry swirl? Like, pour in half of cheesecake batter, swirl, rest of batter, swirl again? In the first photo of swirl-action the crust only looks half-full. I thought maybe that would be the way to get raspberry flavor throughout the whole cake? Kate — Very observant and my bad, I meant to add that to the notes. I was concerned that it would be raspberry enough with just a top swirl so I tried to add a few swirls underneath. They got lost in the baking process but the flavor was incredible. What I wanted to suggest (and will now update with the suggestion of) was that you pour in 1/4 the batter, add a layer of droplets (but don’t swirl) and repeat this three times, only swirling the top. Which will swirl what’s underneath a little. It will only be very pretty on top, but the raspberry puree does taste wonderful, even mixed. Thanks. Liza — I read that as “on tap.” It’s been a busy week! RG — He loved it. But I will ask and see how much he dodges the question. This looks amazing, and I just picked raspberries last week and froze them so I think I know where a few of them will be going. And I haven’t made cheesecake in years, so that definitely needs to change! Pinned! I’ve had the “save money, live better” store order the the Nabisco Famous Chocolate Wafers for me. It seems in some areas of the country they have become a seasonal (Thanksgiving, Christmas) item. In others the are a year round staple. When I get them, I stock up and put some in the freezer. Just lovely, per usual and the trick with mastering the art of swirling…is just, well, fantastic. Good luck with those last few boxes…ugh! This cake reminds me of the pumpkin gingersnap tart in your book, only more decadent given its height (and raspberries, of course!). And I really love this post — pictures from the old place and from the new place, perfectly melded… just like the swirl on that cake! Happy Birthday to Alex (and happy new home to you all). Whoa girl, you are on a roll! Doesn’t it seem that you always figure out how much stuff you have right when you move?! Holy delicious!! There’s something so satisfying about making swirls in desserts. Need to try this! I love cheese cake and this is going to be a big hit with the Fam. Happy B-day Alex! Deb, do you think it would work if one were to insert the squeeze bottle just a little bit into the batter when making the droplets so it would use up more sauce and be a little marbled inside as well? Marce — Wait, hi Marce! And yes. If you have a squeeze bottle, I think you could make more significant dots (Martha does this in the video I linked to) and a pretty design. Smaller droplets, however, make the more delicate one you see in my photos. Instead of foil to wrap my spring form pan, I use a roasting turkey bag. It’s large enough and doesn’t leak. The swirls look delicious! hahahha Hi! It´s been forever, but I´m still alive and kicking :) I´ll watch the video to see how she does it, I figure it´ll look pretty if I just marble the top, the sauce under it will probably swirl a little bit anyway. It´s always cool to try new techniques, I have just done the typical lines joined together with a skewer in a spiderweb type of design. this looks so amazing! i’m doing a cheesecake challenge right now, ten new recipes. i’m still at four so far, so this one is definitely making the list! I moved the other day and I’m glad to see I’m not the only one who can’t figure out what do do with all this stuff! My kitchen isn’t quite ready for prime time yet but when it is, I’m making this cake. It looks sooooo goooood! wait… you moved… which means your pictures will all be different now! no trademark black and white speckled countertop! this makes me irrationally sad. better make some cheesecake in order to feel better. Such a beautiful looking cheesecake, and you make it sound so easy!! Thanks for posting even amidst a move! The only thing I dread about your new cookbook is that time when posts wane. This cheesecake is beautiful! Re the raspberry flavor, do you think it would work to put a layer of raspberry jam on the crust before you pour in the cheescake batter? I am making dessert for a dinner party this weekend and guess what that dessert will be? Raspberries, chocolate and cheesecake. Doesn’t get much better than that. Except for maybe old fashioned banana pudding. Hmmm. Might have to make a batch of that, too. Oh my lord this looks amazing. I wonder how easy this would be to replace the Raspberry swirl with Cherry swirl. Call me old fashioned but I still ove cherry cheesecake the best! 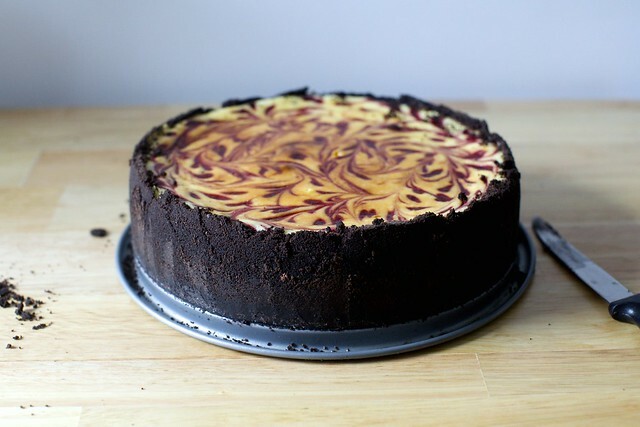 That raspberry swirl is stunning, gorgeous cheesecake! What a beautiful cheesecake!And that chocolate crust–yes please! I found the Nabisco Chocolate Wafers at Safeway. I can send them to you, consider them a house warming present. Hi – I have used the entire Oreo for cheesecake crusts with great results. Just whirl the entire cookie in the food processor with the butter. No additional sugar needed. Best of luck in your new space! Just gorgeous. I still have two boxes to unpack from moving 2 years ago. Thinking I perhaps don’t need those items. Comment disappeared again…I’ll for on. This looks wonderful. Raspberry is my favorite cheesecake. Thanks for explaining the swirl and interior method. Looks wonderful Deb! Love the raspberry with the cocoa crust! That raspberry swirl technique is absolutely gorgeous; I can’t wait to try it it! About those last 6 boxes … one of my son’s preschool teachers told me that the last time she moved she had 6 unpacked boxes. She decided “Whatever is in there, I haven’t missed it,” so she just put them out at the curb with the garbage, without looking inside. There is NO WAY in the world I could do that. I would lie awake at night wondering if I had discarded Grandmother’s family photo albums. I always have trouble with my springform pan leaking no matter how well I wrap it- thus soggy crust and great frustration. I have seen advertised “Pushpan” from Kuhn Rikon that is supposed to be leakproof because it has a gasket. Do you or your readers know anything about it? Seems like a great idea if it actually works. Happy birthday to Alex. That cheesecake is just beautiful. Although I am also a huge chocolate fan, I am not enamored with the chocolate/raspberry combo, but I know that Leibniz also makes a plain butter cookie that would make a delicious crust. Best wishes in your new home! 1) yes, i too am irrationally sad that you have different countertops! i suppose you like them better? 2) i love seeing you in the reflection of the bowl in the cream cheese shot! perfect! Deb this is one beautiful looking cake! Alex is one lucky husband!! I’m a little weak in the knees right now . . . that is one uber-cute cheesecake! How on earth could one possibly forget about such cuteness? ;) I will be dreaming of this delectable treat! JP – I work in a kitchenware store in Minneapolis and we sell the Pushpan. The silicone gasket is very tight, making the possibility of leakage minimal, but it is so tight that I have had difficulty pushing it out when empty. I have not tried it in actual use, just from playing around with it in the store. We have sold a few of them and none have been returned for any reason. When I was a pastry chef I learned to make cheesecake in a regular cake pan with 3″ sides without a removable bottom. Just make the cake as if you were using a springform. If possible, slightly freeze it so it is more solid, then dip it in hot water before turning it out. Obviously this won’t work if you have delicate fresh fruits in it that would be harmed from freezing, but cheesecakes do very well and obviously there is no chance of leakage. I have found that with springform pans you get what you pay for and it took me a long time to justify paying almost $50 for a pan, but haven’t regretted it for even a moment since I got it. Even though it rarely leaks, I still wrap foil around it whenever I use it, just in case. I just made a cheesecake with raspberry coulis for my daughter. I had to painstakingly take the seeds out (ugh). Wouldn’t you have to do the same here? BTW instead of sugar I added rose syrup. I think you would have liked it. 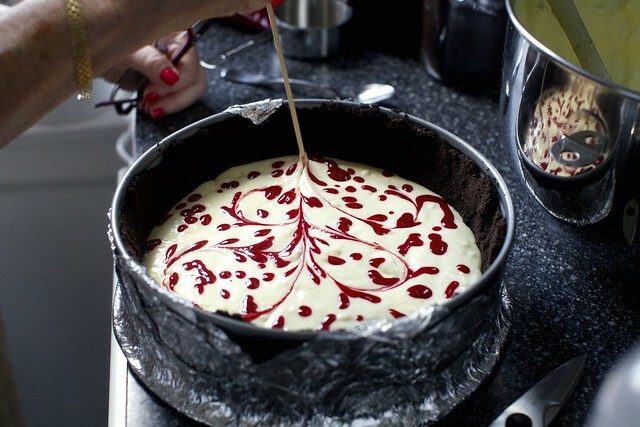 Oh what a delicious looking raspberry swirl cheesecake. Your photos are always so inviting. Bookmarked this one to try soon. Happy new home and happy birthday to the hubby. First of all, the email announcing this post arrived in my inbox 45 minutes ago — i.e., 2:45 a.m. on the East Coast; how can you have 50 comments already? Do you save your email clients for last? Secondly, I have made over 25 cheesecakes in the past couple of years, all modified (reduced) from a recipe I found on a wonderful German woman’s website (Niner Bakes), that she ALSO modified from Martha Stewart. So I’m wondering why you left out two essential ingredients: sour cream (1/2 cup) and flour (1/4 cup). That gives it “tang” and… I dunno. Stability? FORGET the springform pan. Just line two sheets of aluminum foil with suffcient overhang– about 4″on each side — in a pie plate. Generously butter both the pie plate and the aluminum foil with room-temperature butter, and then pour in the filling as usual. Place the pie pan (now a “cheesecake pan”) in your roasting pan or whatever container you have around (I’ve used a large cast-iron skillet), pour in the boiling water, and you’ll bake a perfect, no-crack cheesecake. The “overhang” will become your “handles” when it’s time to take the cheesecake out of the pan the next day. Seriously, Deb — I am SO HAPPY with this solution, because almost nothing is as depressing as soggy crust ruining a delicious cheesecake! P.S. I omit the sugar from the cookie-crust, because there’s enough sugar in the cookies already, and there will be a lot more sugar in the cheesecake and whatever you are swirling within/ladling onto it! I love reading your stuff every bit as much as I love your recipes. You have that gift of relating in a way that is warm and approachable and gives me a chuckle (much needed sometimes). I’m at a place, finally, where I have time to remember how to cook, and I have the idea that I’ll be using mostly your recipes. Thank you so much for your generosity. I’ll be making this cheesecake next week for guests. Oh my goodness, yesterday was my birthday– why didn’t I check Smitten Kitchen, which always seems to have the recipes I need?! The cake sounds and looks so good! That cake looks especially scrumptious with the ganache puddled on top. I remember making raspberry swirl cheesecake cupcakes before but this is way more elegant. Thanks for the idea! Can i put some white chocolste through the cheesecake? I loooooooove the combi white chocolate and raspberries! Or do i need less creamcheese, like 24 oz or so? Thanks in advance for answering and good luck in your new home! Marja — Maybe make a white chocolate ganache for the bottom, as I mention you can do with the dark chocolate in the 4th note below the recipe? Laura — Thanks for the tips; I’m going to try that next time. As for sour cream, some cheesecakes have them, some do not. I make them with both but I have to admit, I’m kind of liking the ones without them more lately. There’s a focus to the cheesecake flavor. Plus, cream cheese (I’ve been falling for Organic Valley brand lately, which, to me, has a clearer cream cheese flavor) has plenty of tang. But no reason you cannot add sour cream if it’s your preference. 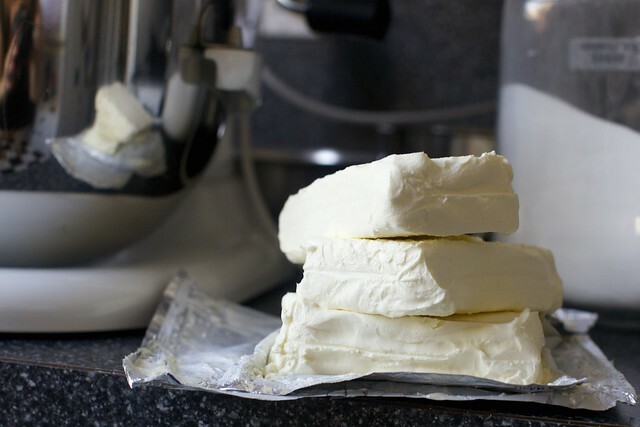 Often it’s done in lieu of a block of cream cheese, using 3/4 cup. Re, 50 comments, actually the email does go out overnight the day after a post, so this went up yesterday at noon. It’s lame. I’m looking to change email providers to one that would send it sooner (and be better formatted, and have more controls, etc.). Ronda — You do; it’s in the 3rd step. Wow, this looks so pretty and delicious! I can only imagine how good the chocolate crust and the raspberry swirled filling taste like together. Lovely pictures, like always! This looks amazing, but more important, I jus stalked your IG. Where did you get your tangram puzzle? I love it! Emily — It’s this one, from Hape. I’ve had great success using a modified water bath by just putting a 9X12 pan filled with water on the oven rack directly below the rack that I’ve put the cheescake on. There’s no chance for a soggy crust that way…and I’ve never had the top of the cheesecake crack ( of course I always grease the spring form pan well, so that helps also). You had me at cheesecake. Seriously, I love the stuff. If I was to be stranded on a desert island, that’s all I’d to be left with me. That and Benedict Cumberbatch or Tom Hiddleston. For the chocolate crumb search, my mom always bought precrushed Oreo baking crumbs for her chocolate cheesecake bases (Turtle cheesecake YUM!) They’re not freshly ground obviously, but I never noticed much difference :) Although a quick google search has led me to thinking that this may be only a Canadian product…most of the boxes seem to be bilingual. Oh, my god. The raspberry swirls look INCREDIBLY professional, well done! Extremely sad to say, but we have yet to host any sort of summer soiree this season. Pathetic, I know. This would make the perfect dessert for the day we get our s*** together. very cool – it looks like Martha made it herself~!!! I need to congratulate you on also marrying a man who continues to get more handsome as he ages (I smiled a big smile at the audacity line, I feel that way about my sweetie, too). I am happy to report that in Canada, getting the basic chocolate wafers doesn’t seem to be an issue. I couldn’t do my mock Yule log (the basic chocolate wafer icebox cake in disguise) with my French language students without them! I truly find it admirable that you continue to make this site a priority. I’m also amazed that you still haven’t given into the ad, sponsored post craze. It means a lot to us readers, especially the former. That said, I hope the posts don’t dwindle too much ;) An assistant sounds like a dream. That cheesecake is stunning! Thanks for the swirl tip, I can never get that part right! Happy birthday to your husband and congratulations on your new home! Also, seriously, what is it about those last six boxes?? @Laura M.#53…that must be a pretty deep dish pie plate! @Margy #50 thank you for the information on the Pushpan. If it is hard to release empty, what would it be like full? To Deb: If I was not on the opposite coast, I would volunteer to be your assistant! I agree with others, so glad you put the blog first and best wishes in your new home. I’ve made this as cheesecake bars for parties and it’s lovely. Deb, I’m sorry if I’ve missed this, but what do you do when the foil around the springform isn’t tight enough and the crust gets soggy? Do you leave it in the oven for longer? Mmmm. The recipe to make the next time my elliptical doesn’t groan in misery at the sight of me approaching in workout gear. Nabisco famous chocolate wafers. For some reason, my grocery doesn’t keep them in the cookie isle. They are shelved with the ice cream accompaniments: jarred sauces, cones, maraschino cherries, which are also near the canned milks. Not sure of the logic, but when I askeda clerk if they no longer carried the cookies, he schlepped me directly there. Wow! This cake is stunning and congratulations on the move, the birthday, and completing both in the same week–high five!! As someone who lives in Berlin I can’t tell you how excited I am that you used chocolate Leibniz cookies rather than some impossible-to-find graham cracker variety. This might also be one of the sexiest cakes I’ve ever seen. Good luck at the new place! I’ve had great success over the years just grinding up whole oreos in the food processor for crusts. The “filling” serves as a substitute for the sugar and butter. Seconding Caitlin’s suggestion for Oreo cookie crumbs — they’re not just a Canadian product. I’ve seen them on the shelf in the mid-west (U.S.) next to the boxes of graham cracker crumbs… but I haven’t looked for them in years. I don’t think they have the creme filling crumbled in; they tasted like straight-up dark cookie crumbs. Welcome to your new home, Deb!! – Totally divine – thank you for the super seasonal recipe! That’s a beauty. Love the fresh raspberries and of course the chocolate crust. Yummy! @JP #71 Actually I tried to include a link to a photo of the pie plate, but the site’s software refused to let me publish the comment, and so I deleted it (luckily I was able to recover my long post with my browser’s “back button). I am NOT trying to promote any brand or store, but if you Google Macy’s Martha Stewart 9” ruffle pie plate, it’s identical to the one I purchased at Publix over Christmas. There is one catch, though, and (perhaps this is what you’re getting at? ): the pie plate’s sloping sides mean it is narrower on the bottom than on the top. Result: the 14 Graham Cracker cookies that I normally use make for too thick a crust. I’ve had to scale back to using only 11 cookies with 6 T of butter. (No sugar in any case.) A little too bad, but that’s the trade-off, and the result is still scrumptious! Deb — what is the reason your preference against sour cream these days? Is it consistency or taste? And what is the chemical effect of using vs. not using flour? Laura — We’re having some trouble with comments that are not spam landing in the spam folder, so it may not have been an issue with your link. (Or, at least, I don’t personally have an issue with someone linking to something they’ve explained the significance of, rather than a random link drop/plug that looks fishy, and didn’t remove it.) Re, sour cream: honestly, I need to make a cheesecake with sour cream alongside one without, but I’d say of the cheesecakes I’ve made the most in the last couple years, there has not been sour cream and I haven’t missed it. There’s something lovely and classic about cream cheese + eggs + sugar. I think flour only becomes a necessity with sour cream, as it is thinner. I don’t think it otherwise improves cheesecake. I’m not sure if this factors, but (not a paid plug, but I hope you guys would already know that) I’ve been using Organic Valley instead of Philadelphia in the last year, as it doesn’t have stabilizers, something I learned about the existence of in some brands from the Jeni’s Splendid Ice Cream Book, and we really find the taste to be lovelier. Munich Girl — Happens to me all of the time; I just bake it longer. Much, much longer. It all works out in the end but it’s definitely not ideal for getting your baking project done quickly. I may not be the only reader who is curious. Please tell us and show us your new KITCHEN! @Monica #73 – When you made bars did you use a rectangular pan? I’m guessing a square pan would be too small with the lower sides. I don’t have a springform pan and I don’t have room to store another pan so I was trying to decide what pan I could use to try this in. I do have a 9 inch round pan, but I don’t think the sides are high enough. Any other suggestions would be appreciated. I did read the comment about the pie plate, but again, I don’t think the sides on my pie plate are high enough. Looks delicious! I may just decide to try one of the pans I have and see what happens! @Monica #73 – When you made bars did you use a rectangular pan? I’m guessing a square pan is too small with the lower sides. I don’t have a springform pan and I don’t have room to store another pan. I was trying to decide what pan I have that I can try and use. I have a 9 inch round and a pie plate (as mentioned in one of the other comments) but I think the sides of both those pans are too short. Any other ideas are appreciated. This looks delicious! I may just have to pick a pan and try it and see what happens! I have an old standby that is 1- add white chocolate to the cheesecake which makes the flavor incredible and actually increases the creaminess of the texture- add about 8oz melted in last step mixing. The accompannying raspberry sauce is the same but with a few splashes of brandy or chambord. I serve it on the side, but now I am considering adding it to the cake!! Mazel Tov on the new place !! I remember moving into our first house. The built up excitement totally squandered by way too many people being involved followed by not enough things for everyone so some just sat around. Can you feel the tension in my typing? ha! This recipe looks amazing though. Pinned so I can try this in the future. Jay – you can easily make a collar to extend the side of the 9″ pan. 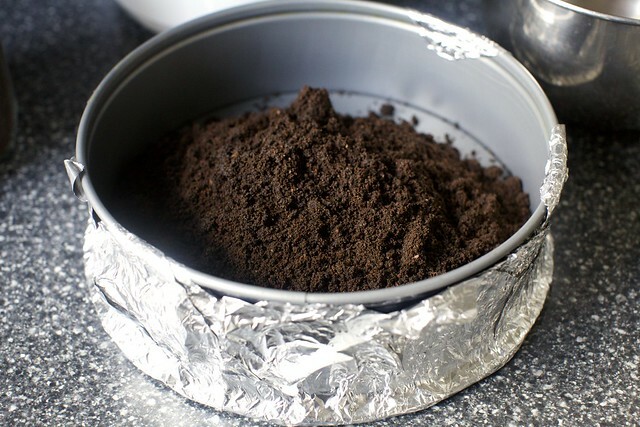 Just take a long sheet of aluminum foil ( I like to use heavy duty for this but regular will work), lay it down on your counter with long side facing you. Fold up the edge 3″ and then keep on folding it over on itself until you end up with a very long band of 3″ foil. Place it on the inside of the pan against the edges, making sure it overlaps itself a couple of inches. Secure the overlap with something ( I usually use a paper clip that I remove after baking). Voila – the pan now has higher sides! I don’t know if my description is clear but this method is often used to extend the sides of soufflé dishes and I’m guessing you could find something with pictures if you do a search. When I made the chocolate peanut butter cheesecake, I found the Nabisco chocolate wafers by asking a Stop & Shop employee – she pointed them out on the top shelf in the cookie aisle, high above my line of sight! My S&S is in New Jersey, so perhaps when you venture over a bridge you might have some luck there. I also really enjoyed the ground bar chocolate in that cheesecake’s crust. Yum. Good luck with the rest of your unpacking, and prioritizing the whiskey was no doubt a good idea. Those famous chocolate wafers – I found them at a big chain grocery store in New Jersey (I guess I can’t mention the name) – but they were in the cookie aisle all the way on the top shelf, way above my line of sight. I had to have an employee point them out to me. I also like the ground bar chocolate in the crust, as in your peanut butter chocolate cheesecake. Yum. Good luck with the rest of the unpacking! What about trying this with nonfat cream cheese? Has anyone experimented with that? We tried it with Neufchatel, with 1/3 less fat, but haven’t tasted it yet.I know that cheesecake is not meant to be healthfood, but I wonder how light it can go. Instead of foil, why not use a 9 inch diameter silicon pan, as like a springform pan condom? I don’t own one, but I see silicon pans at the thrift store all the time- I bet it will work. Looks beautiful! As a major hoarder (as soon as I throw it away, I will inevitably need it), I anticipate many, many extra non-prioritized boxes in my move. You can still buy Famous Wafers in Manhattan! I just bought a box this afternoon at the Fairway at 74th and Broadway. I’ve also found them at Gristede’s. Also, you can make a very fine crust with Oreos without bothering to discard the innards. Just leave out the sugar and all will be well. My standard cheesecake is from a recipe by Marlene Sorosky that uses Oreos for the crust. I was cynical and made it for years with Famous Wafers instead, but couldn’t find them once and used the Oreos. I couldn’t tell the difference. Here is the link to the Oreo cheesecake recipe. I have never made it with the Oreo filling, but I bet it’s good. @Margy #88 – Thank you for the instructions for making the collar. Although your instructions are clear I did a search out of curiosity and found instructions and images. Thanks so much. I can’t wait to make this! Jay #96, as for the sides of a 9″ pie plate, creating the 3″ to 4″ overhang on both sides has done the trick for me. It’s true that the finished product may have a bit of a “homemade look” around the edges, but everybody I served it to was so busy swooning over the cheesecake that they don’t seem to notice. Bear in mind that the next day, when you remove the cheesecake from the refrigerator, it will be VERY HEAVY and also VERY STABLE. The (buttered-on-both-sides) aluminum foil just peels away so very easily. Can’t wait to try Deb’s swirl effect! Hi Deb.. The chocolate wafers are in the IGA s out east.. You can stock up on your holiday..I hope you are still taking one, sounds like you could use one. Everyone loses momentum on those last few boxes.. Sometimes they just stay unpacked! ..if you haven’t found it in the next ten years, you probably didn’t need it in the first place! I had two comments when reading about this cake. 1. Deb, have you ever seen the bags around some of the food stores for an item called Sheila’s Brownie Brittle. It’s kind of a cookie, kind of wafer type of item. I’ve used it ground up as pir crust nj place of graham cracker crumbs. 2. Have you ever tried what I call the Craig Claiborne cheesecake? I use this one as the basis for all of my cheesecakes. You don’t bake the cake with the crust, and put it on at the end. To me, no other recipe compares, but I see this one is actually very similar. This looks delicious like all your recipes, but I am writing to let you know there has been an ongoing problem with viewing your site on safari. Maybe it is just me or maybe not. I get a bunch of pop-up warnings, it freezes, and quits the program. Any idea what is different in the last few weeks and how it can be remedied? My current workaround is to use a different browser. Thanks! Lauren — I’m sorry to hear this; is anyone else having trouble viewing the site on Safari? I can ask my tech guy to look into it. Jenn — I saw those at Whole Foods, but didn’t try them. I also have a request in my inbox somewhere from someone who wanted me to reverse engineer them. I should try them first, huh? Re, Craig Claiborne — I have not, but that sounds really clever. Recipe-wise, it’s not terribly different from this, furthering my theory that sour cream-less cheesecakes are more popular. I bet the crust stays much more crisp with his method. This has to be the prettiest swirled cheesecake I ever did see. I must try this dot and swirl technique! Man! It turned out gorgeous!! My dad is the exact same way about cake (or any dessert for that matter). As you’re talking about unpacking, our family is packing (and to think I thought it’s been difficult!). But i will start preparing myself for unpacking mode ;). Made this for my moms birthday and it was absolutely perfect! Thanks for sharing! This recipe looks amazing. I’ve never made cheesecake, but this looks like I might have to. Also, I found Leibniz cookies on Amazon…. Thanks for this recipe. I have made so many cheesecakes in my time, most turning out horriblely. This is delicious & the top did not crack! I am thinking this is the reason for the water. I’d love to know more about stabilizers…they seem to be in so many products, even “healthy” ones. When I was looking to pick up ice cream at whole foods the other day, there was maybe one brand that didn’t have any. The discussion also made me wonder about how you handle eggs in your recipe testing. Do you use farm eggs for everything? I’d imagine you can probably go through quite a few when testing and retesting a recipe like this one. ATG — I am not exactly an expert on them, but stabilizers can come in many forms, such as Xanthan Gum, Carob Bean Gum, and/or Guar Gum, which are all listed on the Philadelphia label. Although I’d rather eat food with only natural ingredients, I’m not a huge stickler but after reading in Jeni’s Splendid Ice Cream book that she really preferred Organic Valley cream cheese because it had “a clean dairy flavor and minimal natural thickeners” I was curious to try it, too. To me, it immediately tasted better and I was converted. There’s nothing wrong with using Philadelphia, which is considered the baking standard and basically all I used until 6 months ago, but if you’re curious, it might be worth trying other brands with fewer ingredients on the label. Made this Sunday for my husbands birthday – my first cheesecake ever. And let me tell you – it won’t be my last! Knocked the socks off all the New Yorkers (including a 88 yr old), so it passed the acid test. I served it with fresh raspberries and drizzled more of the sauce for those who wanted more raspberry flavor. Will be trying Organic Valley next time I am in the market for cream cheese. Philadelphia was one of the few things I never thought to question. This is crazy good looking. LOVE the swirls on top and totally agree that you shouldn’t have covered it in ganache. Smart move! Cannot wait to make this sometime very soon! On turning 40 (now that we’re 45+)…a male friend told me that as men age they look more and more like Sean Connery, and as women age they look more and more like Sean Connery. I told him I may not be his friend anymore – who needs such truth? Thanks for the cheesecake recipe. Looks beautiful. Superbe! un vrai chef-d’oeuvre ! Deb, would like to make this for DD1 who is coming to visit next week. She is gluten-free, any suggestions on what I can use to sub for the chocolate wafers OR do you think I can make the cheesecake without the crust? Thanks! Deb-such a fabulous recipe and so so beautiful! Made it this morning and followed your suggestions regarding the crust-I added some dark cocoa powder in addition to some ground chocolate-worked like a dream! Thinking about popping the crust in the freezer next time before I bake-for some reason it didn’t set fully-any idea? I recently have moved as well (literally – first 10 days of August), and we moved within our apartment building, just like you guys did. I COMPLETELY understand your opening paragraph. My cupboards are full and I’ve got ALL THIS STUFF and I’m like “how is this right?!?! the last place was SMALLER, this place technically has MORE cupboard space but I HAVE STUFF THAT NEEDS A PLACE.” Totally get it. Love the photo of your moms hands helping you :) I just put this in the oven and called my husband to take a look and he’s like, hey that looks just like those photos on the “baking fail” sites! Have you ever seen those? They’re hilarious. I was wondering if there is a sugar free version of the raspberry swirl cheesecake? I am diabetic and would love to make one. It looks yummy.. I can get sugar free cookies but was wondering about using sugar substitute..
Made this cake yesterday for my husband’s 65th birthday. Beautiful and delicious. Thank you, Deb! Deb – do you taste before or after photographing? I would never be able to wait, especially when you get something fresh out of the oven! Hi Deb – making the cheesecake as we speak! However, bit confused by the instruction to keep my frozen raspberries unthawed. I’m just getting a very pretty sorbet in my food processor! Any tips? Keep whizzing? Grace — Whoops. I clearly hadn’t thought that through. I will adjust the recipe to make it clear that they should be defrosted. Hope it all worked out in the end. Incredible this cheesecake. I´m a cheese lover, so i will cook this cake in weekend. Regards! Made for the second time today (my son turns 15 tomorrow and he specifically requested this). Wouldn’t change a thing, except I doubled the raspberries for twice the sauce and served with a puddle of that and a puddle of the chocolate underneath each perfectly lovely slice. Thanks! Deb, this was a-mazing! Made it for my boyfriend’s birthday. I declared it to be the best cheesecake I’ve ever made, while he one-upped me to say it was the best cheesecake he’s ever had (And he’s had many. Despite being slightly lactose intolerant, he adooores cheesecake.). Thank you!!! This was really a phenomenal end-of-summer treat; thanks for the recipe! I was looking for something to do with the leftover raspberry seeds and pulp, since it seemed like a waste just to throw them out. I ended up mixing them with 2/3 cup of water, froze them into a tray of ice cubes, and served them in lime seltzer along with the cheesecake – a really great complement to the dessert. As for chocolate wafers in NYC, trader joe’s sells dark chocolate quadratini wafers, which worked really well for my crust. Thanks so much, Deb! Turns out I had the amount of cookies and raspberries wrong (ounces are my enemy, grrr). Thanks again! Great to have you back! Just made this for MY husband’s birthday. A definite hit. Found my Nabisco chocolate wafers at the local Giant (in my experience, they’re on the top shelf at supermarkets, making it hard for short people like me to see them). Given all the concerns about water baths, foil leakage, and cracks, used Stephanie’s suggestion of a turkey bag. Put the pan in the bag, trimmed the excess top off the bag, then put the whole thing in the water bath. No leaks, no cracks. So I’ve made this twice now. The first time I made it to take to the office and it was beautiful but all my attempts at cheesecake have been miserable, so I thought “at least it looks pretty.” Then, when a colleague and myself cut into it to steal a piece we both knew what had just occurred. This could NOT be taken to work. We promptly invited more friends over and devoured it. The second time, I made it gluten free by changing the cookies in the crust. That one made it to work and practically got me a promotion. I’m wanting to make this with a ginger snap crust and canned pumpkin (because it’s that time of year where I pumpkinize everything), but I’m wondering your thoughts: should I remove one of the packages of cream cheese and use the pumpkin as a sub and just whip it all together? The beauty of this cheesecake is the fluffiness and creaminess, but I don’t want to ruin it with the density of the pumpkin. I made a half recipe in a 2″ tall, 7″ spring form. I decided to take your advice on seeking out a cream cheese without texturizers and the only one I was able to get, Arla Organic, was spreadable, so I added 2 tbsp of flour because I worried the batter was runny. Really delicious cream cheese: only dairy, salt and culture. I’ve continued to eat it on the chocolate biscuits I used for the crust. A very nice cookie with only recognizeable ingredients. When I first tasted it, for some reason (maybe because I’d just tasted a spiced molasses cookie?) I didn’t think they had a lot of chocolate flavour, so I added a generous amount of cocoa to my crust, but after I made the crust, I ate another and revised my opinion. Nice clear cocoa flavour. The crust might have been fine without additional cocoa. I don’t have black cocoa, so I didn’t think I’d get a nice dark crust, but once I mixed the butter into the crumbs, it was quite nicely dark and stayed that way through baking. Came out really well! It’s been years since I’ve made cheesecake. Glad I bought a 7″ springform just for this, since in my family, although we like cheesecake, we don’t eat very big portions. I have a 6″, too, but 7″ just looks nicer for a small party. The smaller pan also guaranteed my foil jacket did not leak since the foil was well wide enough. I looked at the ingredients again for the Dare cookies, and, I guess soy lecithin and unstated “natural flavours” is a little outside the home cook’s pantry, but still, at least there are no weird tasting artificial flavours. I have this in the oven now; I can’t wait to try it! One question, though — the color of my raspberry swirls look rather faded, not like the vibrant red that you have. Am I missing something? (I used fresh raspberries). Thanks! Hm, I’m not sure why this would happen. However, I have found that the color of raspberries, especially fresh ones, varies wildly. When I make these bars, sometimes they’re pale peachy pink (as picture), other times they’re almost magenta. I always use fresh raspberries. 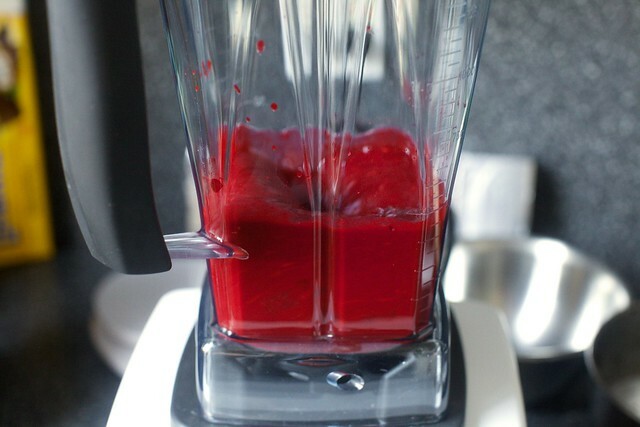 This variation in juice color is most likely the culprit. I could never get my swirls to come out as pretty as this. Will be trying this recipe soon! This is an excellent and easy cheesecake recipe! Very moist but fully cooked through. Mine baked in 80 minutes to perfection. Next time I will follow Deb’s suggestion of adding more raspberry in layers, and just swirling the top. Without doing this, the raspberry flavor wasn’t really noticeable, just added some nice detail on top. Surprisingly I found Goya chocolate wafers at the Dollar Tree this Christmas 2014. There was only 7 oz. in the package. so I added about 8 Oreos to the food processor for the crust with thr listed ingredients and directions. I was wondering if this is freezable as other cheesecakes? Not sure because of the fruit content or would it be ok since it has been processed with some sugar. A long while back I made your chocolate peanut butter cheesecake and froze it. A cousin of mine who was lucky enough to come by and have some still remembered it after a year or two later. Could imake these in a mini cheesecake pan? Tish — I don’t see why not. Michelle — I have a Kaiser one that I’ve been pretty happy with. Not sure how the Williams-Sonoma gold touch springforms are, but I’ve been very happy with other cake pans from that line (which look like the day I bought them, even 8 years later). Gwen — Most 9-inch cakes can be neatly halved in 6-inch pans. Or, you can halve it right in the same pan, you’ll just have a cake half as tall. Is it possible to make this cake w/o a water bath or is it necessary? Michelle — You can but the water bath improves texture and prevents cracking. Do some cheesecakes hold up to non-waterbath baking than others? I was just curious. Also, I’m making my first cheesecake tonight. (Hence all the questions). Fingers Crossed! Michelle — Yes, I don’t usually bother with it, but it does improve texture and prevent cracking. Personally, I’ve never been bothered by cracking in cheesecakes, especially because a lot of the recipes on this site finish with sour cream, ganache or fruit, thus any cracks are hidden. But this one is not, so I bothered. And thank you — hope it is a hit. Thanks for the response, Deb! The cheesecake was perfect—even better than I imagined. To anyone else who’s hoping to halve the recipe: I halved all ingredients, including the crust, and baked in an 8 x 8-inch baking dish lined with parchment, “floating” in a 9 x 13-inch pan of water. I baked the crust as written, but the cheesecake itself was finished after 40 to 45 minutes. Might want to check a few minutes earlier in case your oven is hotter than mine! The first time I made this cheesecake (I think it was beginners luck) I thought I had finally found my eternal cheesecake. It was seriously that good. A little while later I was craving this cheesecake and thought I would make it again. However I came across a problem I have never encountered and has left me truly confuddled. I followed the recipe exactly (no changes, promise). It came together wonderfully (just like last time). I poured into my baked biscuit base and put it in the oven feeling rather chuffed. Now this is where it got a bit weird. Around an hour into the baking I thought I would check on it as my oven doesn’t always behave the way it should. I opened the door and saw what looked like water droplets seeping out from a small crack that had formed (not bothered by the crack by the way). Thought it was a little strange but just assumed it would all work out in the wash. Once I thought it had baked I pulled it out of the oven to do a skewer test. I do this to make sure the centre of the cheesecake is no longer liquid. When I pulled my skewer out there was just water on it! It looked as though I had just dipped the skewer in a cup of water. I tried wiggling the skewer round and noticed lumps of curdled (but cooked) cheesecake. After allowing it to cool down in the oven I placed it in the fridge hoping that it may somehow fix it. After leaving it for over 12 hours I took it out and cut into it. The chunky curdled bits had set hard, really hard and the liquid was still quite loose. I have no idea where I went wrong and was wondering if you could shed any light at all. I plan on making it again as I really did love it the first time, but just wanted to trouble shoot before I take the plunge. I love your website .. just so you know. This is my go to cheesecake base and then I adapt it. Last week it was actually a raspberry swirl cheesecake on a graham cracker crumb crust served with a raspberry coulis, tonight it is a vanilla cheesecake on an Oreo cookie crumb crust with a chopped toasted pecans and a chocolate ganache topping (from your peanut butter cheesecake) and drizzled with a caramel sauce from another of your recipes. MMMmmmmm …. so good. Deb, I don’t know what happened, but even after 70 minutes in the oven and an appearance that matched your description (set but loose Jell-O) the insides of this beauty were underdone and custardy. The flavor was wonderful, though! Any ideas why it wouldn’t have set up in the allotted time? I’m worried that maybe I added too much water to the pan – would that have slowed the cooking time considerably? For those looking for ways to keep the crust from getting soggy: I decided that, since the bain-marie is so essential to a creamy cheesecake and since I couldn’t ever prevent leakage completely, I invested in a push pan with a silicone seal. It works like a dream. Leah — Most likely, water leaked in. That’s for me the only times it just bakes and bakes and bakes and never sets. That said, 70 minutes is only 5 minutes longer, but since it was basically raw, more likely leakage. Ah! So the water leaked into the foil (but not the pan, since the crust showed no signs of sogginess) and basically meant I was slow-boiling the cheesecake! That would explain it…and the 1/2 cup of water that I poured out of the foil when I removed it from the oven. Thanks! Delicious and super easy to make! It even look as pretty , which normally doesn’t happen. Thanks! I painstakingly pulled apart the Oreos. Then ran some chocolate over my zester. Fine flavour. Great recipe,glad it’s out here..
Hi Deb! (or anyone there, listening) I’m trying to think of a Thanksgiving dessert, and I’ve always loved your cheesecakes. 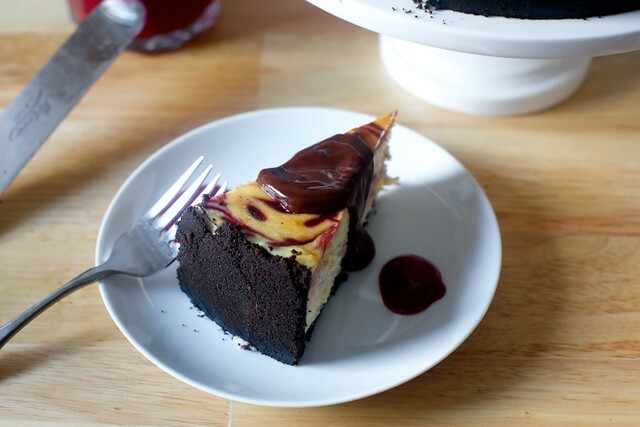 If I treated cranberries like raspberries in this recipe, and strained the puree, do you think the flavor of the cranberries would work well with the chocolate in the cheesecake? I’m also thinking I’d add a little lemon zest to the cheesecake filling. Absolutely. 100%. I’d add orange zest, but either would be welcome. I’ve made this recipe 3x so far with a few variations on the fruit- loved each one! Was wondering your thoughts on swirling in caramel instead? Thanks! Caramel more often gets lost in cheesecakes, at least homemade ones, so I’m not confident it will show up as well as the fruit. Perhaps a chocolate sauce? Hello, Deb 😊 thank you for this and so many other beautiful recipes that you share in a manner that communicates the basic cooking principles at work, so that a self-taught home baker like me can learn and adapt endlessly to local seasons and ingredients. I just adapted this recipe to make a mango swirl cheesecake as mangoes are the highlight of our summer in humid Mumbai..it has turned out gorgeous. Wish i could share a photo of the cake with you. If ever you would like to try this recipe with mango, i recommend adding couple of teaspoons of milk while pureeing the fruit with sugar. Thank you again! Made this for the second time – the swirl method is the easiest thing but totally impresses people! I’ll be tasting this one tomorrow but the first time I made it a couple years ago, it was perfectly creamy. I use a 10-inch springform and I just cut the batter down by 1/4 (24oz of cheese; 3 eggs; and 225g sugar). Fits the pan perfectly. OK, I have a potentially idiotic question about the water bath and avoiding the burn unit. If I put the water in a shallow-ish roasting pan and then had the cheesecake in that, I don’t see how I could even get it out of the oven without sloshing boiling water on myself. If I used your suggestion of putting the water in a pot (which I love, because I’m not sure I even have a roasting pan that my springform would fit into), that would be deep enough to avoid injury when taking it out of the oven, but then can it stay in the water bath until it cools? I don’t know how I’d get it out of there while still hot. Overall very pleased with how this turned out! Used gingersnaps to make the crust, which was *amazing*! I had a minor butter leakage issue with the crust; maybe gingersnaps aren’t as absorbent as the chocolate cookies used here. Found myself wishing for more raspberry (the swirls didn’t add much flavor), so I tried mixing the rest of the puree with a white chocolate sauce. It didn’t work–too sweet! Now I know. Next time, I’ll serve with fresh raspberries to get the tart, bright flavor. I put a pan of water on the bottom rack of the oven as the cheesecake baked and didn’t experience any cracking. The texture was super creamy if anyone is hoping to avoid the water bath! Hi Deb! This may be weird but I’m going to make this today, and was wondering why it is required to bake the crust first on this one? I’m allergic to chocolate (yes, sad) and am going to make a traditional graham cracker crust. Can I be lazy and just throw it all in without prebaking the crust, like in your NY cheesecake? It’s just to give it extra texture but to save time, you could skip it. I don’t know if you’re still on the hunt for a chocolate cookie for a crust. I found a great option: Jovial Crispy Cocoa Cookies. https://jovialfoods.com/product/crispy-cocoa-organic-einkorn-cookies/ and Whole Foods has them. Just FYI…found Nabisco Famous Chocolate Wafers on Amazon! Will be ordering for this recipe for sure and freezing what I don’t use for the NEXT cheesecake recipe! I made it last week and baked it in a water bath for 65 minutes. I wrap my spring-form in a plastic slow cooker bag before wrapping in foil. It was beautifully creamy throughout, but the lower center never fully set and stayed very soft. It was a hit, but I think it was about 15-20 minutes of baking time from perfect.